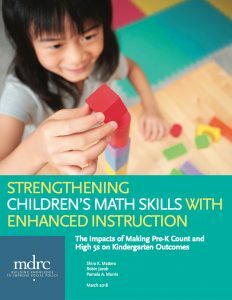 High-quality math instruction aligned across pre-K and kindergarten can provide a significant boost to children from low-income families, and close the achievement gap with their higher-income peers, according to a new study published by education and social policy research organization MDRC. High 5s, a supplemental small-group “math club” provided to kindergartners outside of regular instructional time. The programs were conducted in partnership with Bank Street College, RTI International, and the New York City Department of Education and Administration for Children’s Services. The Heising-Simons Foundation’s Education program supported both the implementation and evaluation of Making Pre-K Count and High 5s. The Overdeck Family Foundation and the Richard W. Goldman Family Foundation also provided lead funding in support of this effort. We invite you to access the full report here.